We're all ready for Thanksgiving and have a lot to be thankful for even with the horrible economy. Still glad we retired earlier than we could have and that our hobbies keep us busy. We miss the camper and the friends/travels of a bit warmer weather. 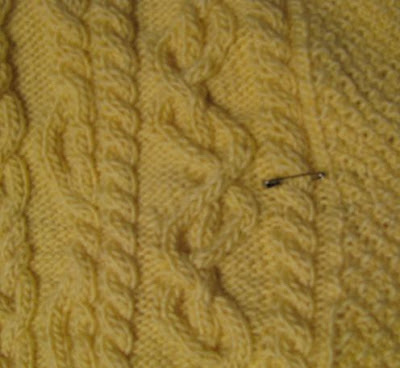 The yellow gift sweater is progressing. Look what I found today? See the cable to the left of the safety pin. It's crossed incorrectly but no way am I ripping out 6" of knitting in the round. I'll try a couple of the online tricks for repairing a cable by sewing over it with yarn in the right direction. No one else but me would ever see this mistake but I want the sweater as perfect as I can get it for sister. Good luck with the sewing over. That seems FAR more sensible to me than the cut, cross behind and graft method (which I've only done once, on a swatch, and it was still scary).